SAN ANTONIO, TX--(Marketwire - July 13, 2010) - The center of tourism in Texas, San Antonio attracts adventure seekers, history buffs, and sightseers, from the legendary Alamo and Mission Trail to the popular River Walk and renowned SeaWorld. So for tourists exploring hotel deals on the River Walk in San Antonio, TX, Marriott is pleased to offer two exciting deals for guests of the San Antonio Marriott Rivercenter. Now through December 31, 2010, the San Antonio Marriott Rivercenter, one of the most popular hotels on the River Walk San Antonio, is offering guests a perfect escape to shopping, dining, and relaxation with the Romantic River Walk Getaway, or the intense family fun and lifelong memories of the Ultimate SeaWorld Experience. With rates starting at $199*, the Romantic River Walk Getaway delivers luxurious accommodations plus complimentary parking, two tickets for a scenic Rio San Antonio river cruise, breakfast for two either at the on-site restaurant or through room service, and coupons for the Rivercenter Mall, Macy's Department Store and other local attractions. 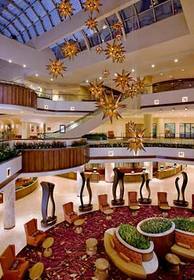 Reservations may be made online at http://www.marriott.com/hotels/hotel-deals/satrc-san-antonio-marriott-rivercenter/ using promotional code ZJL or call 1-800-228-9290 in the US and ask for promotional code ZJL. The Ultimate SeaWorld Experience starts at just $261* and includes two adult day tickets for entrance into SeaWorld. Guests can choose from two different packages that include up to two to four two day passes to SeaWorld, complimentary parking and fun and excitement for the entire family. Families can enjoy the captivating and dramatic shows with Shamu, or hop aboard "The Great White" -- Texas' first inverted steel roller coaster! Reservations may be made online at http://www.marriott.com/hotels/hotel-deals/satrc-san-antonio-marriott-rivercenter/ using promotional code S50 or call 1-800-228-9290 in the US and ask for promotional code S50. With either offer, guests will find stylishly appointed guests rooms and fine amenities that make the hotel a popular choice for visitors to nearby SeaWorld, as well as The Alamo, and the San Antonio Convention Center. Among River Walk hotels, only the Marriott Rivercenter offers an on-site DASA spa, complimentary coffee and tea in-room, expert River Walk hotel staff to help coordinate activities and events, plus a full array of guest services, from babysitting to valet dry-cleaning. Conveniently located, the Marriott Rivercenter is one of several hotels near San Antonio River Walk to offer easy access to the city's many attractions and sights, from funky King William and Southtown, where urban professionals are snatching up historical homes and refurbishing them, and entrepreneurs are launching hip new businesses; to Alamo Heights, home to some of the city's finest dining, and its original suburb. These special offers at this jewel among hotels near the Alamodome will give guests a taste of San Antonio's unique flavor -- and every reason to come back for a return visit. *Valid seven days a week through 12/31/10. A limited number of rooms are available for this promotion. Visit website for additional terms and conditions. The San Antonio Marriott Rivercenter is a AAA 4-diamond hotel conveniently located near SeaWorld, The Alamo, and the San Antonio Convention Center. This luxurious hotel offers 915 rooms and 86 suites on 38 floors, 60,000 sq. ft. of event space, an indoor/outdoor pool, whirlpool, an on-site DASA Spa, fitness center, two on-site restaurants, and access to nearby golf to make any trip to San Antonio an unforgettable one. You never get a second chance to make a first impression. After gazing at our naturally lit, three-story grand lobby, we won¿t need one.